Polymer/Wax Protectant. Liquid version. Carnauba Wax and Polymer blend. Meguiar's standard which is primarily responsible for their fine reputation as a premier car wax developer. Apply using clean terry, foam wrapped in terry or Microfiber or Meguiars foam applicators supplied with the product. Wipe down with a microfiber polishing cloth. Once applied you'll be amazed at how a towel tossed across the surface just slides along until it's on the ground on the other side! This is the standard by how all others should be judged. 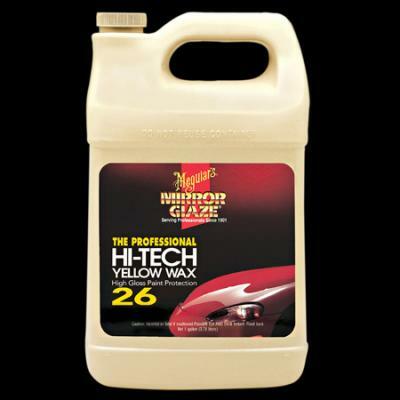 Hi-Tech Yellow Wax is a premium yellow Carnauba wax blended with silicones, polymers and other waxes. Adds richness and depth of color. Provides ultimate high gloss protection to any previously cleaned and polished paint finish. Available in liquid or paste.